So, your upstairs is not cooling? When you walk upstairs on a hot day, does it seem 15 degrees hotter up there than downstairs? You can’t turn the thermostat all the way down without freezing out the downstairs. This also runs up your electricity bill, so what can you do? Unfortunately, this is a common problem for owners of two-story homes, trying to heat and cool both levels. Achieving a consistent temperature is very difficult, and in some cases, it may require a dual zoned system. Take a look at some of the common reasons your upstairs is not cooling. An Under-Insulated Attic — If your attic isn’t properly insulated the heat that’s beating down on your roof all day long will seep through the attic and into the upstairs area. This will make it warmer and uncomfortable than you want it. So, make sure that your attic insulation is up to the recommended level. Leaky air ducts — It’s possible that the ducts connected to your upstairs are leaking out cold air, keeping your AC from cooling the second floor effectively. If Your Attic is too hot — A properly insulated attic can affect your upstairs temperature but while this goes somewhat hand-in-hand with the first point, the trapped heat will not disperse. Installing a large attic fan can help cool the attic and your upstairs as well. Blower – Upstairs temperatures can become more tolerable if you run the blower. Where is the blower ? It is located on the thermostat, locate the switch for the blower, it reflects: “Auto” / “On”. The blower will work in it to the “On” position. The furnace or AC will still cycle with the temperature but constantly mixing the air to keep the temperature more consistent. 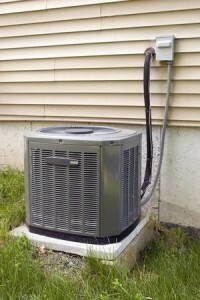 For all your Denver air conditioning maintenance and repair needs, trust the experienced team at Sanders & Johnson. Contact us today for solutions in your home!